The Body Wrap contains contouring clay - a pure and natural solution of volcanic detoxifier – Bentonite, derived from deposits of weathered volcanic ash. It is one of the most effective natural detoxifying agents available and contains over 70 traces of minerals to help detoxify your body, tighten loose tissue, improve cellulite and can result in exceptional and lasting inch loss. compressing the soft tissue on the tummy, buttocks, upper arm and hip area by using elasticated compression bandages to ‘lift’ and ‘shape’ the body. 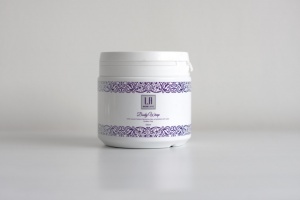 At the same time the clay minerals cleanse and purge toxins stored between the fat cells, leaving your body feeling firmer, smoother and silky soft. Used regularly the Wrap can help you maintain slimmer shape and can be used for different areas. Dry brush or exfoliate the areas you wish to treat. Ensure the area to be treated is clean and dry and no creams or lotions are left on the skin. Decide which treatment areas you wish to wrap. You can choose to do a full body wrap, partial body or spot treatments. Full body wraps start at the ankle and work upward wrapping the entire body. Partial wraps could be your legs, arms, stomach or hips. After 60 minutes remove the cling film, rub in any extra gel, re-measure all of the areas that were wrapped and calculate your total inch-loss figure. There is no need to shower as the clay leaves the skin feeling smooth and the effect of the wrap is enhanced if the solution is not washed off right away. Tighten loose skin or stretch marks. Tone the upper arm area. Maintain overall shape and firmness. Q. How many inches can I lose? A. Customer feedback has shown an average of 4 to 15 inches can be lost within the first application. A. If you continue to detox by drinking plenty of water over the next few days, following a proper diet, excluding sugars, caffeine, smoking and alcohol and follow a light exercise programme, including walking – the inches lost will remain stable. Q. Can men use the Wrap? Q. How often can I use your Body Wraps? A. Body Wraps can be used as often as you would like. However it is recommended that you wait at least 24 hours between treatments. We recommend one wrap per week for 6 weeks and then once a month for maintenance. Please also remember to follow healthy diet and exercise for best result.